One of my favourite things about summer is eating delicious fresh salads, like this Simple Tomato Salad with Red Onion & Mint! 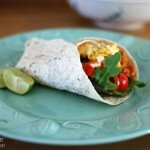 I love creating new recipes when I have time and trying different flavour combinations. Inspiration hit after we returned from our holiday to find a tomato plant gone wild! I decided to use some of our homegrown bounties and create this Tomato Salad. 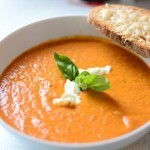 As I mentioned, this recipe was born out of the need to use some of our homegrown tomato harvests! You may have seen my post on Instagram featuring the image below. 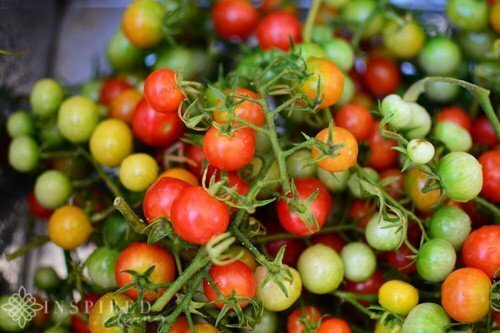 We are on a massive drive at the moment to grow our own produce and tomatoes are super easy to grow! They need very little nurturing or attention and seem to be able to grow almost anywhere. Perfect for those not blessed with “green-fingers”! 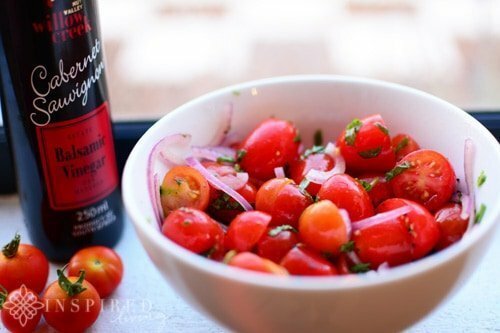 This Simple Tomato Salad with Red Onion and Mint is wonderful with braaied meat but especially good with a seared Beef Steak! 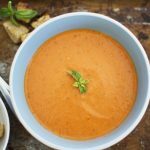 This recipe could not be more simple, plus there is no cooking involved! 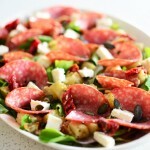 You can also save time and make the salad in advance and refrigerate until you are ready to use it. Wash your tomatoes and slice in half, place into a serving bowl. Quarter a small red onion and slice finely, mix in with the tomatoes. Add 1 tablespoon olive oil and 2 tablespoons balsamic vinegar to the tomatoes and onions and mix well. 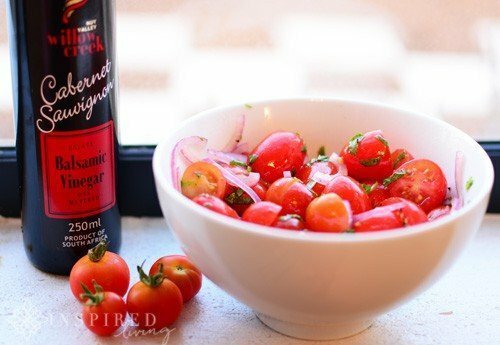 I used the Willow Creek Cabernet Sauvignon Balsamic Vinegar, which has become a firm favourite – it has a wonderfully balanced sweet-sour flavour. Chop the mint and rocket leaves, sprinkle over the tomatoes, add salt and pepper to taste and give it a good stir. It is that simple! Eat immediately or refrigerate until later. Serve with a seared beef steak, a fresh rocket salad and cucumber salad and crispy potato wedges. For more food inspiration and delicious ideas visit our Recipes Page.